Laser Engraving, Personalized Gifts at Laser Xpressions, Inc. Laser Engraving, Personalized Gifts at Laser Xpressions, Inc.
Black Onyx, an elegant stone, is the focal point of this beautiful line of jewelry now carried by Laser Xpressions. 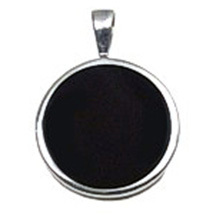 The Black Round Pendant, set in Sterling Silver, is perfect for laser engraving small text or photographs � this is a wonderful gift for any occasion. Black Onyx will laser engrave a white color, providing excellent contrast. **Please note that the Preview function is really just meant to allow you as the customer to get a general idea of what the inscription will look like. Please be rest assured that one of our laser marking specialists will ensure the inscription is formatted in the most appealing way as possible. If, however, you have any special requests as to how the inscription should be aligned, spaced, or laid out, please feel free to provide instructions in the Special Instructions comment box. © 2008 Laser Xpressions, Inc.